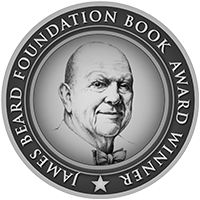 Quite a few of the recipes I have collected over time have become my culinary buddies, friends to celebrate good times just as much as giving me comfort when it gets rough. 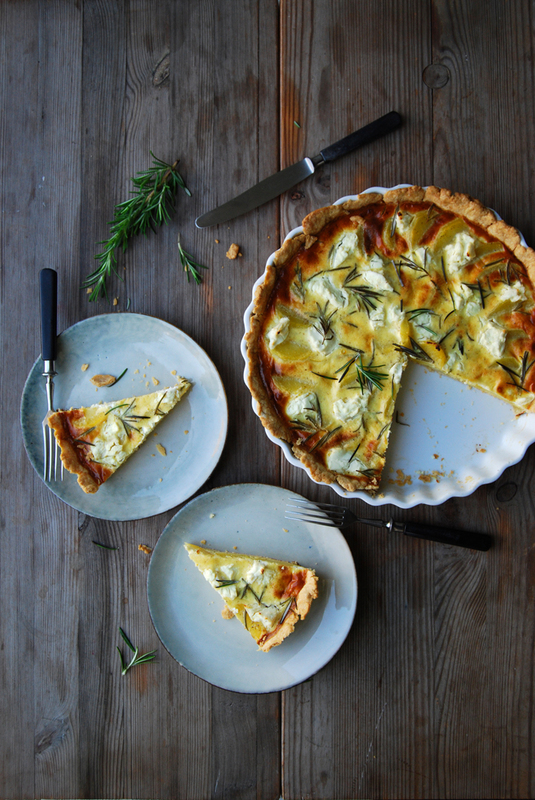 A savory tart, the wonderful French quiche, is definitely one of them. It’s as easy and comforting as pizza and I can adapt the topping to my mood and the seasons which I do with creative passion. There’s also something about the buttery base that gives me great satisfaction. An Italian pizza is a loud feast, preferably enjoyed in the company of friends. The base can be thin and crisp or oily and fluffy like a focaccia, the Italian oven classic is always comfort food at its best. 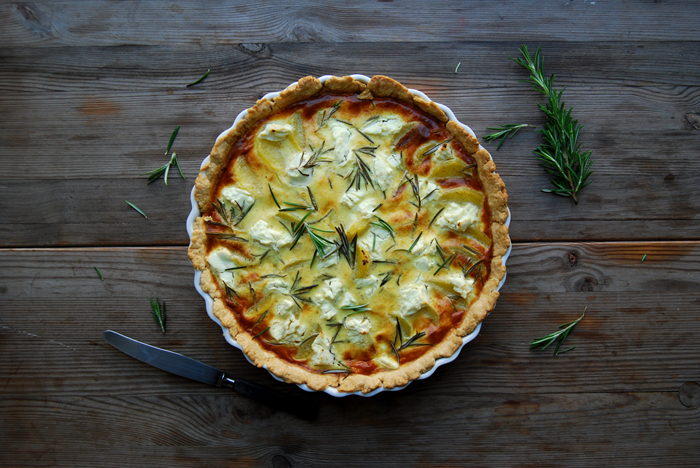 A quiche however, is more intimate, it’s a sensual pleasure. The pastry has to be quite thin for my taste, crumbly and flaky. It’s more delicate which makes it perfect for a romantic rendez-vous at home or at a picnic in the countryside. All you need is the love of your life and a bottle of Bordeaux to accompany this treat and I can almost ensure you a fantastic date! 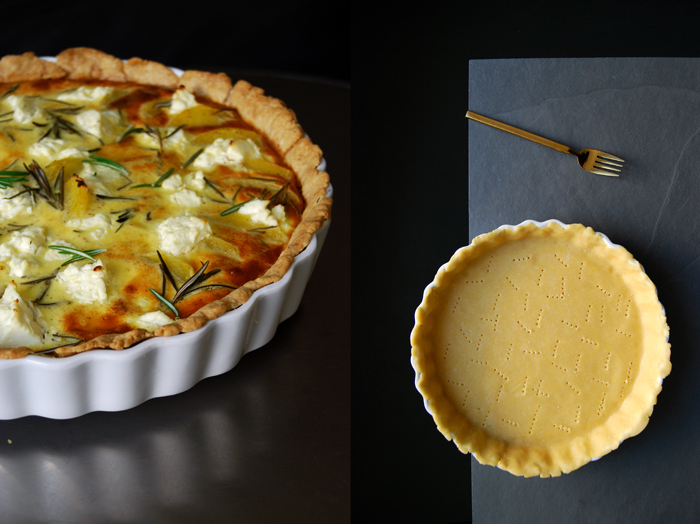 There are already quite a few quiche recipes on eat in my kitchen and I can’t stop adding more, it shows that we have it on our table at least once or twice a month. There’s one with tomatoes and mozzarella, beans and ramp, leek, fennel and possibly a couple more. 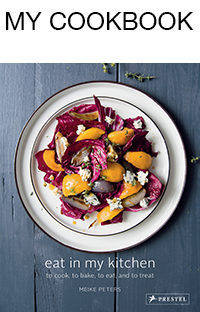 Today’s recipe feels like a trip to the Provence in the peak of summer. 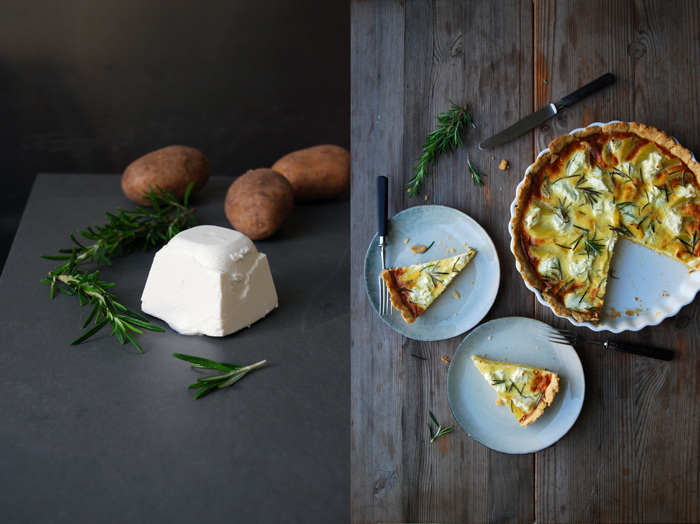 Although the potatoes give it a hearty, Northern touch, the milky chèvre and woody rosemary take it right back to the Mediterranean! Combine the flour with the salt. Cut the butter with a knife into the flour until there are just little pieces of butter left. Continue with your fingers and work the butter into the flour until combined (there shouldn’t be any lumps of butter left). Add the egg and continue mixing with the hooks of your mixer until you have a crumbly mixture. Form a disc, wrap in cling film and put in the freezer for 10 minutes. Set the oven to 200°C / 390°F top/ bottom heat. Roll out the dough between cling film and line your baking dish with the flat pastry. Prick it with a fork and blind-bake in the hot oven for 14 minutes or until golden. Take your baking dish out of the oven and set the temperature down to 180°C / 355°F. Whisk the eggs with the heavy cream, sour cream, salt, pepper and nutmeg. 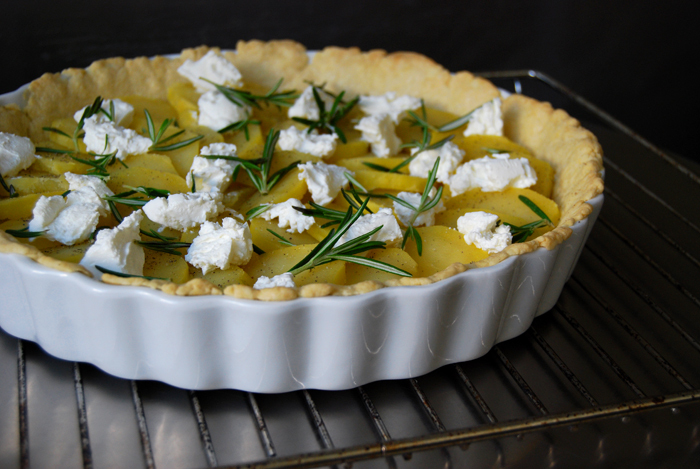 Lay the sliced potatoes on top of the pre-baked pastry base and spread the chèvre in lumps on top. 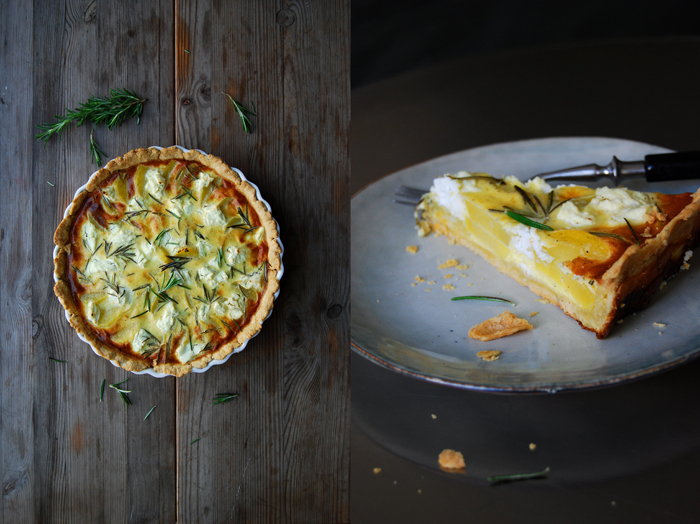 Season with a little salt and pepper, sprinkle with rosemary needles and pour the egg – cream mixture over it. Bake the tart in the oven for about 55 minutes or until golden brown, the top should be firm. Let it cool for a few minutes before serving.